The Untouchables – Four of the most avoided fighters in the United Kingdom return to action on Frank Warren’s first card of 2018 at London’s Copper Box Arena on Saturday 10th February, live on BT Sport and BoxNation. 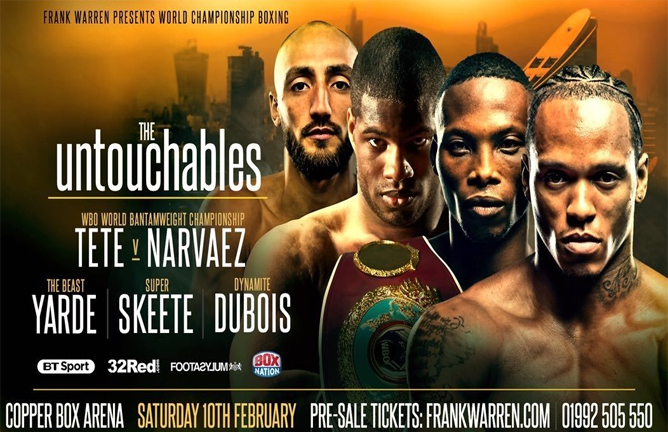 The bumper ‘UNTOUCHABLES’ card at the Olympic Park venue will feature Anthony Yarde, Daniel Dubois, Bradley Skeete and WBO World Bantamweight Champion Zolani Tete, as they each seek to entice their elusive rivals into the ring to set up a big 2018. Ilford Light-Heavyweight Anthony Yarde (14-0, 13 KO’s) is quickly establishing himself as one of the rising stars of boxing and will be aiming to pick up from where he left off in 2017 after becoming the first man to stop Nikola Sjekloca with a heavy-handed display last weekend which lasted less than four rounds. A fruitful 2017 that saw Yarde win the Southern Area, WBO Intercontinental and WBO European Light-Heavyweight belts has cemented his position as the number one Light-Heavyweight in Britain and he is determined to prove it by enticing Londoner Frank Buglioni into the ring, which has so far proven difficult for the big punching ‘Beast From the East’. “Everyone knows that an offer has been made for Buglioni to fight me,” said Yarde. “If he really wants to fight me like he says he does then let’s make it happen on February 10th. This is the fight everybody wants to see, I’m the number one Light-Heavyweight in the UK and he’s number two. Heavyweight sensation Daniel ‘Dynamite’ Dubois (6-0, 6 KO’s) returns to action after his two-round destruction of former Anthony Joshua opponent Dorian Darch. Dubois floored the Welshman four times on the way to his sixth successive stoppage win and is determined to kick-off the New Year with another explosive KO win. Already a Southern Area and WBC World Youth Champion, the young giant could be adding more belts before his 21st birthday in September. “Daniel is by far the most exciting young Heavyweight prospect that I have seen during my 37 years as a boxing promoter,” said Frank Warren. “He is also the hardest prospect to match because nobody wants to get in the ring with him! British Welterweight Champion Bradley ‘Super’ Skeete (27-1, 12 KO’s) wants to throw his name into World Title contention after securing the Lord Lonsdale belt outright against Dale Evans last time out at the Copper Box Arena. The Penge punch picker was left bitterly frustrated when WBO World Champion Jeff Horn, a fight that at one stage looked possible, declined to defend his Title against him and instead opted for Gary Corcoran. Skeete is undeterred and will be hoping to secure a dream World Title shot later in 2018. Also in action, is WBO Bantamweight Champion of the World Zolani Tete, who makes the second defence of his crown against Omar Andres Narvaez. Tete (26-3, 21 KO’s) stopped Siboniso Gonya in just eleven seconds last month, sleeping him with the very first punch of the fight and setting a new World record for the fastest KO ever recorded in a World Title fight. The 29-year-old landed a brutal right hook just six seconds into the bout to retain his WBO Bantamweight title at Belfast’s SSE Arena. ‘Last Born’ is determined to prove he is the best 118lbs fighter on the planet by unifying the division in what would be a huge showdown with Belfast’s IBF and WBA Super Bantamweight Champion Ryan Burnett, but must first come through his latest test against Narvaez. The Argentinian (47-2-2, 25 KO) is 4-0 since a knockout loss to Japanese superstar Naoya Inoue and recently forced unbeaten Nikolai Potapov to quit in seven. He has held the WBO Flyweight and Super-Flyweight World Titles and will be aiming to become a three-weight World Champion by defeating Tete. Tete however has become frustrated that the three belt unification with Burnett has so far proved elusive and will be looking to take those frustrations out on his mandatory challenger Narvaez on February 10th. “Where is Ryan Burnett at?” asked Tete. “I want to unify the Bantamweight division and he is standing in my way. As a World Champion it is your duty to fight the best in the World. I am willing to travel anywhere on the planet to unify the Bantamweight division. If Burnett wants me to travel to Belfast I will happily do it. If he wants to be considered a top fighter and seriously be considered a unified champion he should want to test himself against the best. “My promoter Frank Warren has offered to pay my purse for me to fight Burnett on a card promoted by his team. This means it will be by far Burnett’s biggest pay day. It is the biggest fight in the division, for the most money, to not fight me when there are no obstacles in the way would be shameful and cowardly. Further exciting additions to the February 10 undercard will be announced in due course.